Not many days are left in completion of holy month of Ramadan and preparations for the joyful event of Eid al Fitr are already underway in different parts of the world, especially in Muslim countries. Most of us are aware that Ramadan somewhat slows business activity (though, one can also overcome this issue by adopting strategies favorable in Ramadan). But if there is any negative effect on businesses in Ramadan, then it can easily be overturned with the arrival of happy Eid festival that is celebrated soon after the end of Ramadan. There are different activities intended solely for the occasion of Eid in UAE and other Muslim countries and all these activities boost businesses of various types on local and international level. Eid al Fitr is usually celebrated with sweets and other eatables in homes and parties. People tend to enjoy this occasion with family and friends in their homes, hotels, restaurants, parks etc. Therefore, lots of eatables are purchased in the last days of Ramadan to fully celebrate this festive occasion. This provides boost to grocery stores and different malls that provide these eatables. This activity is so strong and intense that it can easily surpass the whole business of retailers during Ramadan. Hotels and restaurants also get their share of Eid. UAE, especially Dubai, is home to millions of expats that either work here or live for business or other reasons. Most of these expats likes to enjoy this important religious occasion with their family members in their native countries. This certainly gives boost to the traveling sector a lot. Airlines, traveling agents and other related businesses gain handsome profit during these days as a result of departure and arrival of millions of passengers before and after Eid respectively. Due to large expat population, UAE is perhaps the best country in the Muslim world to achieve such benefit of Eid regarding air traveling. Eid holidays last for 3 to 4 days for most people in UAE. Initial days are spent on meeting with relatives and friends. But the last two days are usually reserved for visiting different beautiful places. These exclusive activities are especially important for entertainment industry (cinemas, parks etc.) as they suffer badly during Ramadan. It is the time for this sector to regain its profits that stood at halt during whole month of Ramadan. These places are also visited by thousands of visitors from neighboring Muslim countries during Eid. The entertainment industry in UAE almost completely relies on non-Muslim population and tourists during Ramadan. But soon after the arrival of Eid al Fitr, it regains its activities, momentum and profits. 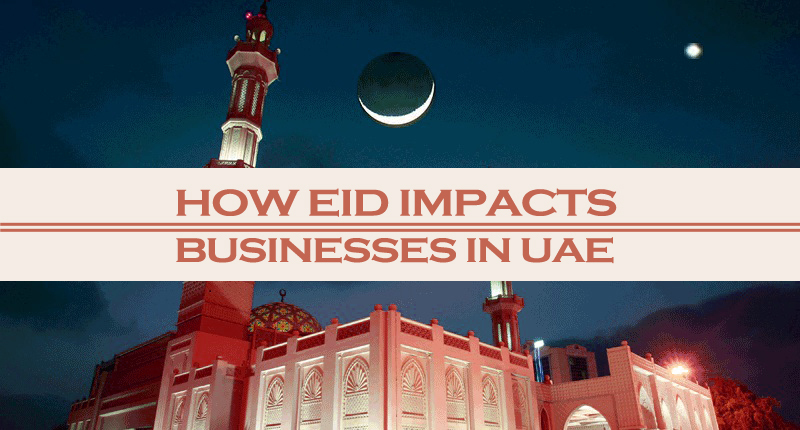 These are few of several business sectors that take advantage with the arrival of Eid al Fitr in UAE. These sectors make special arrangements for Eid (providing concessions, starting special activities etc.). The massive business activity during this joyful occasion benefits not only business persons and workers related to such companies but it also boosts the overall economic growth of UAE.